If described Kayla and Andrew’s Harvest Moon wedding event in just three words, it would be joyous, charming and delightful! This fun loving couple wanted to be close to nature on their big day. 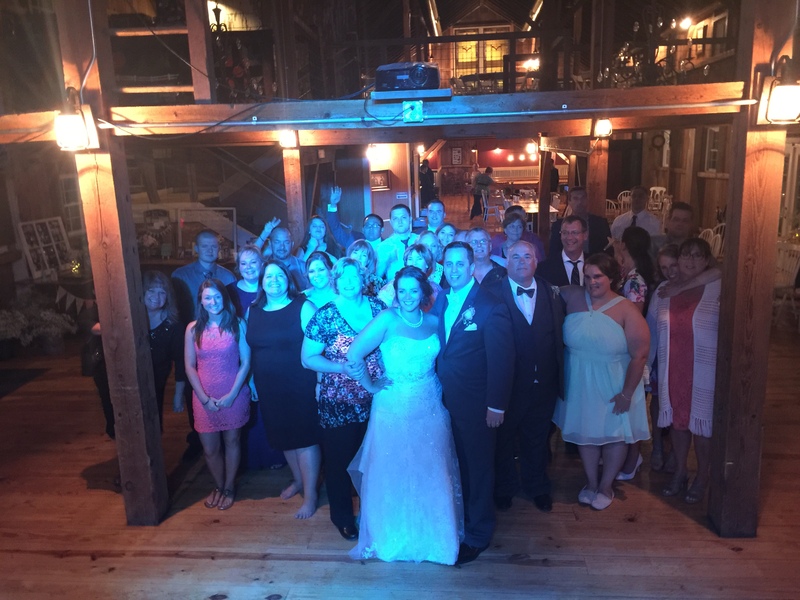 Therefore, they decided on an outdoor ceremony followed by an elegant reception within a chic and rustic barn. The Barn at Harvest Moon Pond is open year-round, close to hotels and located in Poynette, Wisconsin. Congratulations Kayla and Andrew! 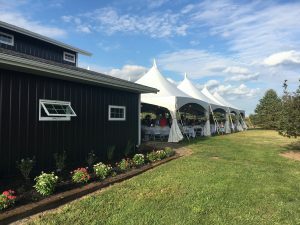 From the decor to the style, the Harvest Moon wedding event felt like the perfect backyard summer party. The couple set up vintage milk cans, Radio Flyer red wagons and hay bales for their ceremony. 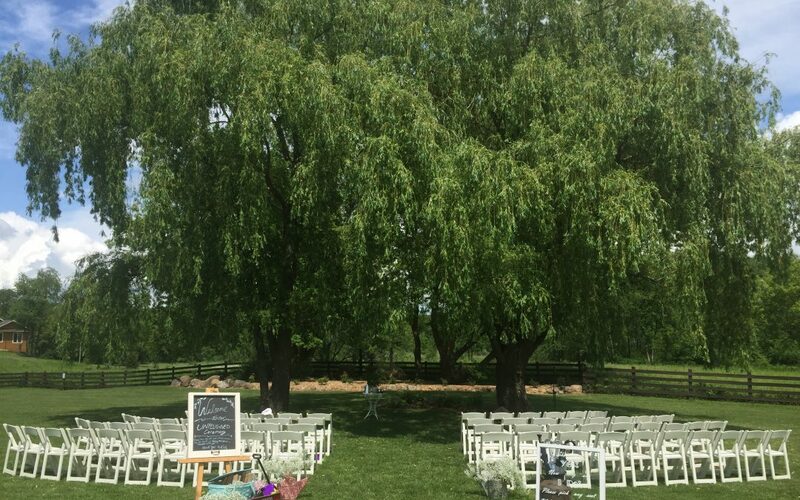 This added a hint of rustic charm as the bride and groom exchanged vows under two large willow trees. It was looking a bit uncertain for an outdoor vow exchange as it was raining prior to the ceremony. Luckily our performers Mike Potts and Greg Percifield were able to escape the downpour and set up outside. 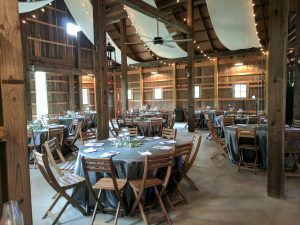 This spectacular venue offers acres of woods, a small lake and a farm pasture. Additionally, a bonus for your event is 2 stages – one inside the barn and one out on the barn’s patio. As a matter of fact, both stages sport a built in speaker and projection system! If you would like to visit The Barn and Harvest Moon Pond please click here. After the couple exchanged vows, the wedding party and guests wandered off to the patio area enjoying cocktail hour. As our performers played light background jazz music, friends and family relaxed while getting to know each other. Moreover, guests enjoyed dancing on the patio to songs such as On the Sunny Side of the Street by Willie Nelson. Prior to our dinner show, guests enjoyed an outdoor game of giant Jenga! 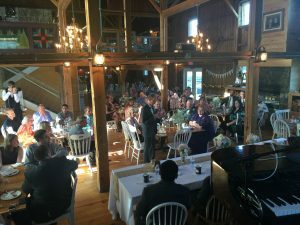 The Harvest Moon wedding event presented with an “Unplugged” theme in their announcements to fit in with the barn feel and two pianos. In all honesty, Kayla and Andrew’s wedding gave us that WOW factor from start to finish. 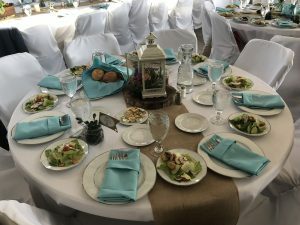 To start with, the Harvest Moon wedding event served locally catered and delicious farm fresh pork tenderloin. In addition to the tenderloin, we enjoyed an amazing roasted chicken paired with creamy scalloped potatoes. During dinner, Mike and Greg brought romantic ambiance to the room while playing songs such as Dreamy by Sarah Vaughan. Wanting to keep the reception relaxed and low-key, the couple planned their wedding as if it was any Saturday night party. For example, the bride and groom had beer kegs brought in and placed in strategic corners. Not only did we have everyone line dance, but Indian Outlaw by Tim McGraw had guests singing at the top of their lungs! Above all, we played a great mix of song genres throughout the night, making sure everyone was on the dance floor – Grandparents included. 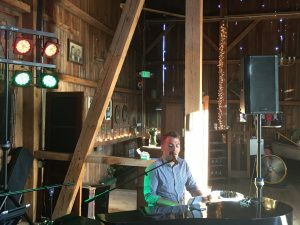 In conclusion, Greg and Mike had a blast performing for the Harvest Moon wedding event. It was awesome to hear everyone have a GREAT time! This was a fun crowd that gave us tons of compliments. If you would like Felix and Fingers to perform at your next event email us at info@felixandfingers.com or click here for more information. We look forward to hearing from you soon!